With the start of a new year, there is no shortage of forecasts about almost everything under the sun. Forecasts about the economy and the financial markets abound throughout the financial news media and on the various cable financial news shows. Here is my fearless and guaranteed to be accurate 2014 stock market forecast. As the top financial officer of one of my retirement plan sponsor clients predicts at the start of each year, I can say with 100% confidence that the stock market as a whole and the various market benchmarks will finish 2014 either higher, lower, or unchanged when compared with the levels at the end of 2013. Further I will make the same prediction for your overall portfolio and for each of the individual investments you hold including mutual funds, ETFs, individual stocks, bonds, closed-end funds, and all other investment vehicles. Forecasts are fun, but at the end of the day the performance of the financial markets and your individual holdings is beyond your control. While the details underlying some of these forecasts are worth reading, as investors we need to focus on the factors that we can control versus worrying about what the market will or won’t do. Morningstar, the PBS Frontline program The Retirement Gamble, and many other sources have highlighted the negative impact that high cost investments can have on your returns and the amount you accumulate for retirement and other goals. Expense ratios on mutual funds, ETFs, closed-end funds, and variable annuities. Transaction costs to buy or sell investment vehicles, this also includes front and back-end sales charges on mutual funds and annuities. Like anything else you want to keep these expenses as reasonable as possible and be sure that you are receiving appropriate value for any expenses incurred. While many of the pundits are saying stocks are undervalued, with the Dow, the S&P 500, and other market benchmarks at or near record highs the markets are inherently more risky. For example the S&P 500 had its best year since 1997. Even after big gains in 1997 the index had solid years in 1998 and 1998 before the Dot Com bubble and subsequent decline from mid 2000 thru most of 2002. The markets may well continue on this pace in 2014 and beyond, but at some point we will see a correction. Don’t become overconfident or complacent. A good way to keep portfolio risk in check is to periodically rebalance your portfolio. This is very important in a rising market like this one where your equity allocation can quickly exceed your desired allocation. Along these same lines make sure that your portfolio is diversified. This does not mean owning a large number of individual holdings but rather having some portfolio holdings whose performance is not closely correlated to the rest of portfolio. Perhaps the most important investing element under your control is having a financial plan in place. My biggest beef with “financial advisors” who focus on selling financial products is that they seem to lead with a sales pitch rather than with a financial plan. Regular readers of this blog know that I am an advocate of an investing strategy that is an outgrowth of your financial plan. I view investing as a vehicle to achieve your financial and life goals such as funding college for your kids and retirement. How can you invest in a fashion that supports your goals and is appropriate for your time frame to achieve these goals and your risk tolerance without a financial plan in place? Joe Granville was a well-known market forecaster of the 1970s, 1980s, and 1990s. He published a popular newsletter, The Granville Market Letter, which had a notoriously poor track record. He was also quite entertaining. I had the occasion to see his “show” circa 1980 or ’81 as a graduate student at Milwaukee’s Marquette University. All I recall is Granville playing the piano in his suit and boxer shorts on stage at a local movie theater. Mr. Granville died in 2013, rest in peace Joe. Check out this excellent piece about Granville by Mark Hulbert on Market Watch Four lessons Joe Granville taught us. Meredith Whitney made a famous call about impending doom and gloom in the municipal bond market in an interview with 60 Minutes in late 2010. Guess what, outside of the Detroit bankruptcy her prediction was pretty much a bust. This hasn’t stopped the likes of CNBC from featuring here as a frequent guest expert. Barry Ritholz summed it up very nicely in this post Meredith Whitney, 2011 Winner, Elaine Garzarelli One-Hit Wonder Award on his excellent blog The Big Picture. I’m not dismissing market forecasts out of hand; much of the research and analysis behind these forecasts is interesting and valuable to investors. However at the end of the day investing is about you, your goals, and your tolerance for risk. Control the factors that you can control and don’t lose a lot of sleep worrying about the factors you can’t control. Please contact me at 847-506-9827 for a complimentary 30-minute consultation to discuss all of your financial planning and investing questions. Check out our Financial Planning and Investment Advice for Individuals page to learn more about our services. New Stock Market Highs: It’s Different This Time Right? Dow 18,000 – A Big Deal? Good post Roger! I find watching/reading some of the forecasts entertaining, but it stops at that level personally. The problem is that too many don’t and take action off these prognostications which usually just does them harm and not good. That’s why your point about focusing on what you can control and having that detailed plan are so vital. Thanks John. Some of the better forecasts have some good underlying detail and offer some insights investors might consider. But at the end of the day much of what will happen in the markets in 2014 or any year is beyond our control. The best course of action in my opinion is to position your portfolio in line with your long-term goals, risk tolerance, etc. “The various market benchmarks will finish 2014 either higher, lower, or unchanged when compared with the levels at the end of 2013.” Give that man a ceeegar! Well, not really, because they are bad for you. I totally agree that we have no control over the market, and can only control our asset allocation through rebalancing. Thanks for the comment Bryce. I agree with you. 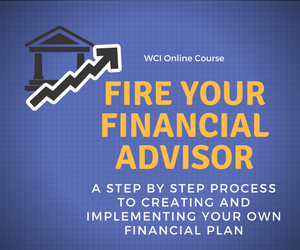 Many financial advisors lead people down a path of more confusion because they’re focusing on themselves instead of their clients. Thanks for your comment, sadly what you say is all too true. Garzarelli is no one hit wonder. She predicted the crises and stock market crash almost to the day and gave a buy signal almost at the very bottom and has been bullish (correctly) since. The disclaimer always goes “past success is no guarantee…” but she is definitely not a one hit wonder. Thanks for your comment Al.